Growing up on the northwest side of Houston, Ross Coleman says his mama always took care of the holiday meals. “We would usually have a nice gathering and would eat traditional things like turkey, ham, mac n’ cheese, chitlins, and sweet potato pie,” he recalls. Holiday comfort food recipes from your favorite Texas chefs. 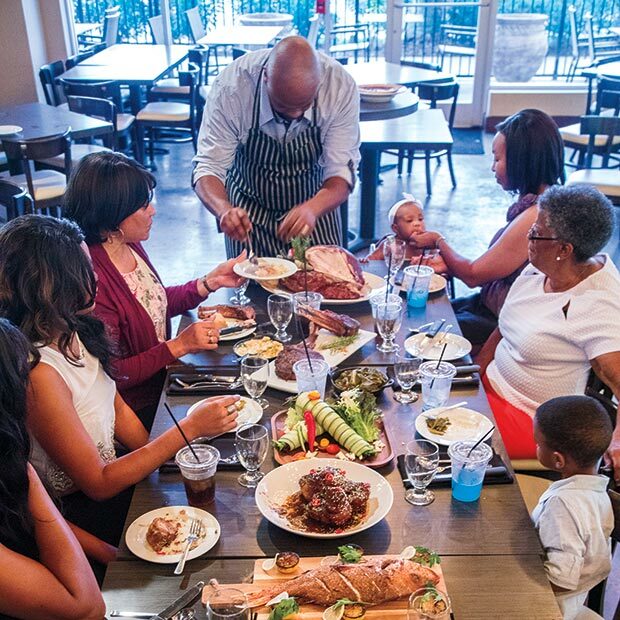 These days, when it comes to preparing holiday meals, Ross, who owns Kitchen 713 in Houston with chef/co-owner James Haywood, is the one in charge of the family meals. And in the same way that his restaurant serves globally inspired Southern cuisine, he tends to change things up when cooking at home. For Christmas, that means bringing a little culinary flair to his smoked turkey with a Cajun-style brown gravy flavored with crab meat, crawfish, and shrimp. Lamb chops, likewise, don’t just get grilled. Ross marinates the whole rack in salt and pepper, onion and garlic powders, mustard, and hot sauce; cold smokes the entire rack; then finishes it over an open fire on the grill. In a large stockpot, sauté bell peppers, celery, and onion in 3 T. oil for about 5 minutes until soft. Add chopped garlic and sauté for 2 minutes. Add chicken stock, black-eyed peas, ham hock, andouille sausage, cherry tomatoes, and mustard greens. Bring to a boil, lower heat, and let simmer for 1 to 1.5 hours until peas are soft. Add water as necessary, keeping the water level 1 to 2 inches above the beans. Once the beans are tender, turn off heat and add Parmesan rind; let sit for 15 minutes. Add salt and pepper to taste.